Ernie and Bruce will have tables there! They have a trout pond. I went to this one on Saturday. Pretty good stuff. Lots of rods and reels for sale and good deals on plastics and crankbaits. It was similar to the Dale City show. There were over 300 paid at the Boonsboro show last week! Who's going to the Rapidan show on Saturday? I am planning to go and to stop at Smokin' Billy's for some brisket. I will be at PSG show smelling pit beef and slurping oysters. Oh and selling free brochures. That's good pit beef up there. Quite the combo with oysters! Someone asked me if all my fishing related activities were surrounded by food...yep!! Who's going to the Rapidan show on Saturday?. 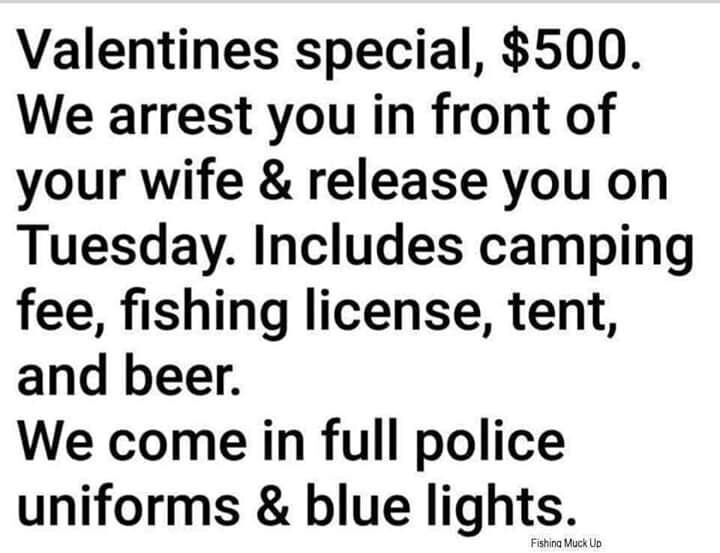 Hmmmm....Valaentine's Day is on Thursday. You combining both? Ernie I didn't see you at the Hillendale Flea Market this year. I'll probably skip the Rapidan TU show. I usually go for Ed Lawrence's shallow water seminar but looks like he won't be there this time. We skipped it this year as were were not quite yet organized. The good news is that we have plenty to sell and are awaiting on a couple more donations. Everything is now categorized, priced and in boxes. Before, we had it in3 different place. I guess Ed is retiring. I like to go to this one because I pass right by Smokin' Billy's! Saw that earlier and read it to my wife. She said, "when are you going"? She's used to me going fishing...often. Last year, at this time, I was totally focused on getting my back issue taken care of. Now, the back is perfect but the weather does not behave. I know a good doc....just sayin'! So does Curly. Once I went to see him, we put a plan in place and stuck to it. In my case, surgery was the answer after trying a few other things and pinpointing the issue (cyst that was impinging on a nerve). Regardless, a little roto rooter will fix you up, I bet!